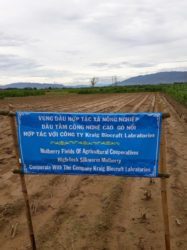 ANN ARBOR, Mich., – July 31, 2018 – Kraig Biocraft Laboratories, Inc. (OTCQB: KBLB) (“Company”), the leading developer of spider silk based fibers announces today that work has begun under the collaborative agreement signed between the Company and several farming cooperatives in Quang Nam Province, Vietnam. As part of the agreement reported earlier this month, these farming cooperatives have now begun planting mulberry. This mulberry is the key input for the Company’s newly formed subsidiary, Prodigy Textiles, its proprietary hybrid silkworms, and the commercialization of the Company’s recombinant spider silk materials. Silkworms are voracious eaters, consuming more than 100 kilograms of mulberry leaves for every kilogram of finished silk produced. For this reason, transportation logistics and local sourcing of mulberry are core to the Company’s strategic plan. Under these agreements the Company expects that as many as 2,500 hectares (~6177 acres) of mulberry will be planted near the Company’s new factory, supporting Prodigy Textiles spider silk production for several years to come. Kraig Biocraft Laboratories, Inc. (www.KraigLabs.com), a reporting biotechnology company is the leading developer of genetically engineered spider silk based fiber technologies. The Company has achieved a series of scientific breakthroughs in the area of spider silk technology with implications for the global textile industry. This entry was posted on July 31, 2018 by Admin.